Marie Morin is a french producer of desserts, specifically potted desserts, mostly puddings, available in grocery stores. Except they aren't like the sorts of puddings we get in the US, no plastic cups, no plastic taste. These are legit puddings, served in glass containers. Right away, you can see why they caught my interest. I love puddings! I quickly looked the company up. A family run business, started by, you guessed it, Marin Morin. After success in France, they expanded to Canada too, but I had them while I was visiting Paris. The product line in France has chocolate mousse (both milk and dark chocolate varieties), chocolate cake, ile flottante, citron yuzu tart, pistachio cake with a chocolate center, apple crumble, cheesecake (chocolate or caramel), some kind of almond pear dessert, cherry clafoutis, rice pudding, and creme brulee. They also make potted yogurts. 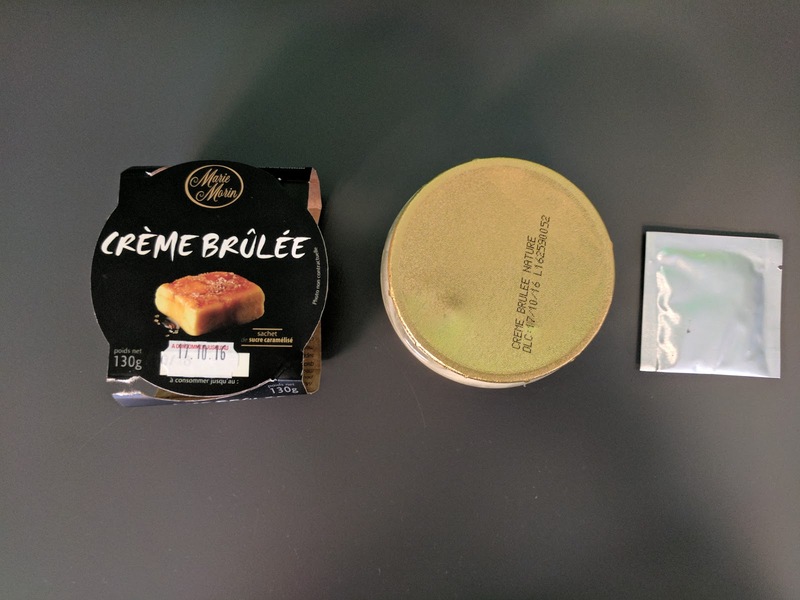 The product line in Canada is smaller, and consists of chocolate mousse, chocolate souffle, lemon cheesecake, creme brûlée, apple crumble, and caramel custard. I didn't actually go out and purchase these at a grocery store myself, instead, they were stocked in the microkitchen at my office, so I wasn't able to sample the full product line. Sadly, the rice pudding never appeared there, but I did get to try the creme brûlée, which I was obviously very skeptical, and interested by. Overall, the items I tried were far better than the equivalent, mass produced, generic grocery store stocked, long shelf life products we have in the US, but they were not exactly the quality level of something freshly made. Still, wonderful to have on hand for a snack anytime. 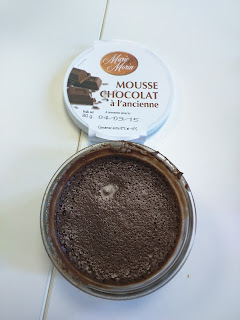 Mousse au chocolat noir / Dark Chocolate Mousse. 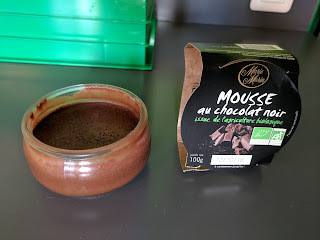 The first item I tried was a lighter colored chocolate mousse, still called a dark chocolate mousse (noir), but not as dark as the old fashioned version. It had a nice flavor, and I liked that the very top was a bit thicker, but, the pudding itself was pretty runny and I didn't care for it. Mousse au chocolat à l'ancienne / Old Fashioned Chocolate Mousse. "This old fashioned chocolate mousse recipe Marie Morin is prepared with only natural ingredients without artificial coloring or preservatives: chocolate 100% pure cocoa butter, eggs and salt butter. 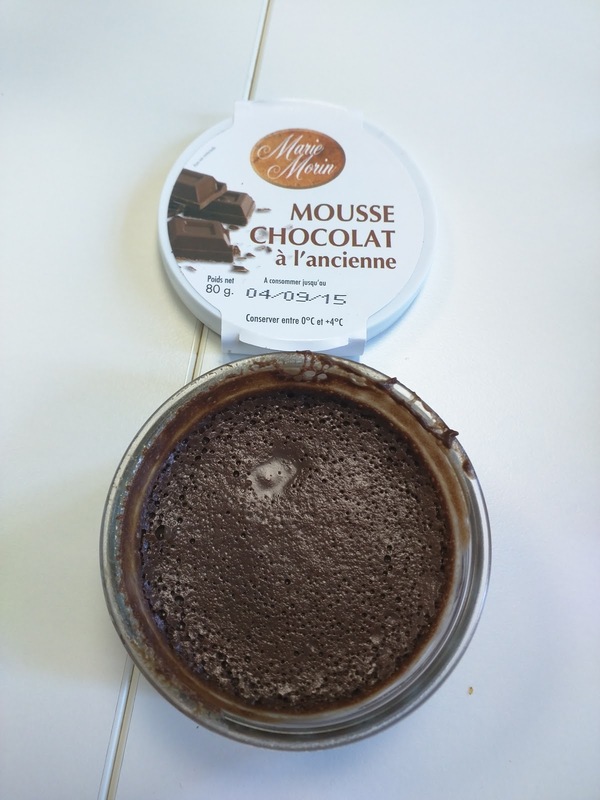 Under its cover, see the firm texture of the mousse very creamy and generous chocolate. Powerful aromas of chocolate in the mouth draw a beautiful cocoa for a delightful dining experience. Fresh, simple and authentic, this chocolate mousse recipe is THE recipe Marie Morin, worthy of a chocolate mousse house." The old fashioned dark chocolate mousse was ... almost good. The texture was really light and fluffy, which was appealing at first, but it somehow broke down immediately. The chocolate flavor however wasn't very strong at all, which was a surprising given how dark it was. Tarte au citron meringuée / Lemon Meringue Pie. Next up was one I'd never normally pick since I dislike citrus desserts, but, it was the only option that day, and I do love meringue. 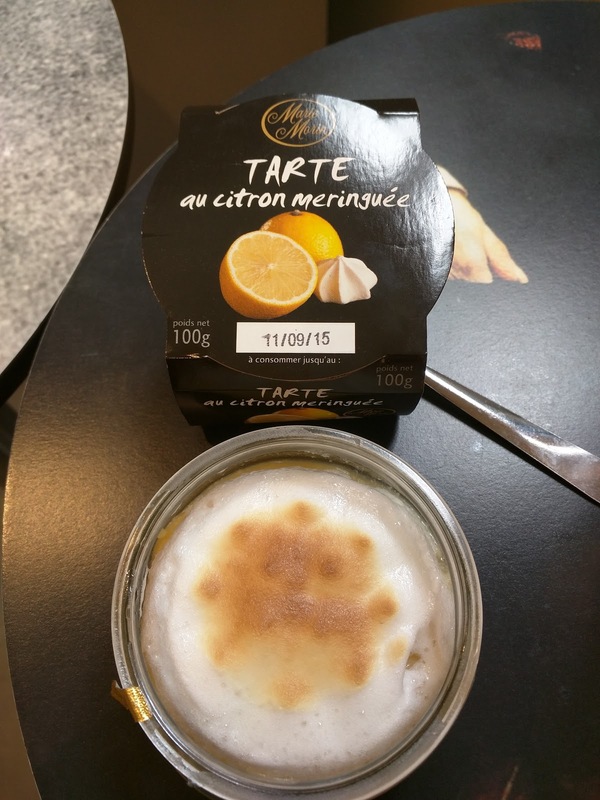 The lemon pudding had a decent flavor, but was fairly gritty in a strange way. And, because lemon, it certainly wasn't to my liking. The meringue looked great, even toasted on top, and tasted pretty good too. It scared me a bit though, how did it stay stable for weeks? This item has been replaced by a version with yuzu infused in it. 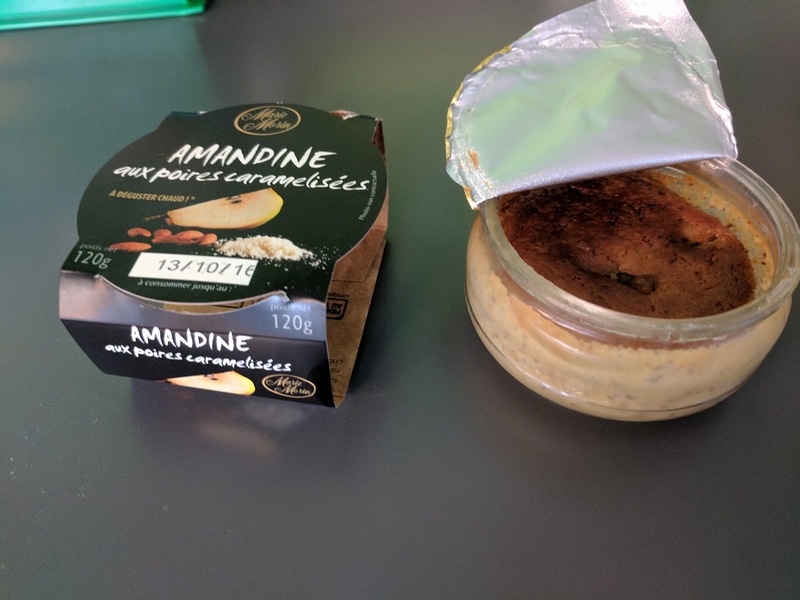 Amandine aux poires caramélisées / Caramelized Pear Almond Cake. This was the first cake style item I tried. It wasn't awful. A moist, dense, almond cake, with some sweet caramelized pears in the base. It isn't really what I tend to go for, but, for what it was, it was good. The instructions say to microwave it, which I didn't see until too late. I'm curious how different it would be if warm. "The top cream. 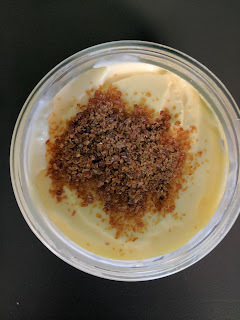 Cream, milk,eggs,sugar are the main ingredients with our personal touch… A creme brulee so unique, so tasty, so creamy, so…with a thin layer of caramel crisp..."
And last but not least, one of my all time favorite desserts: crème brûlée! This one was a bit more involved than the others, as it came with a packet on the side of additional crystalized sugar that you are supposed to sprinkle on top (and, ideally, bake). I didn't have an oven, so, I had to settle for just sprinkling the sugar on top, and not actually bruleeing it. That said, I still really enjoyed it. In some ways, yes, it was just packaged pudding, in a fancy glass jar, but, it really was quite tasty. Thick, rich, vanilla pudding. I wish our grocery stores had this instead of Snack Packs. The huge sugar crystals were good even when just sprinkled on top too. Not crème brûlée obviously, but, they were sweet and added a nice crunch. Overall, quite tasty, my favorite of the products I tried, and I'd gladly have another. 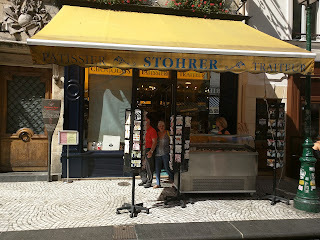 Stohrer: the oldest pastry shop in Paris. Seriously old, they've been in operation since 1730. I obviously had to check it out, even though I was skeptical. 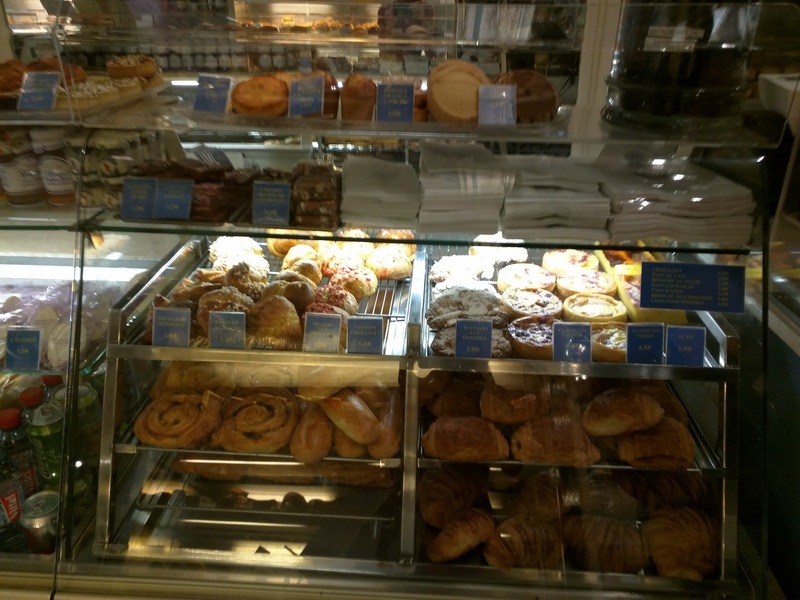 It sounded potentially like a tourist attraction, more than a good place to get pastries. 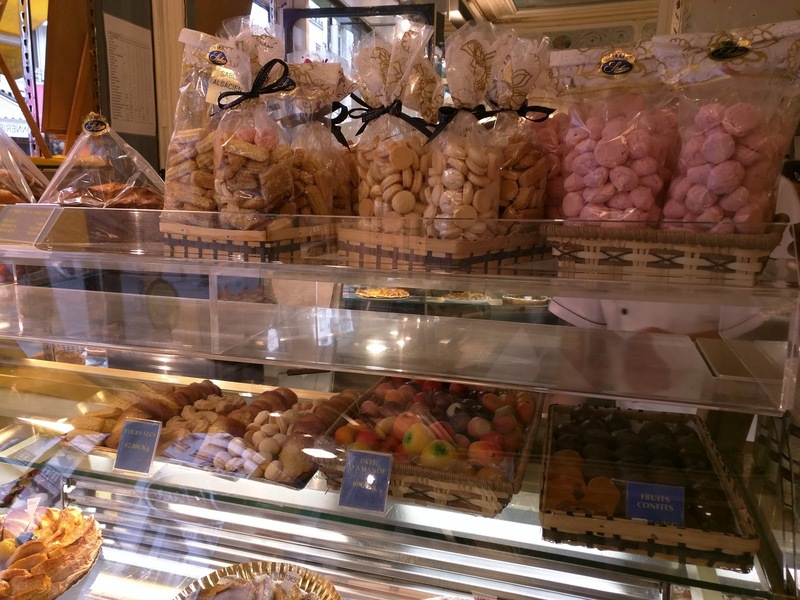 Paris is filled with great pâtisseries, I didn't want to waste any of my precious stomach space on mediocre pastry! I thought Stohrer stood a chance though, since it is located on rue Montorgueil in the 2nd arrondissement, a cute cobblestone street, with plenty of local Parisians strolling through with baguettes under their arms. The rest of the street is boulangeries, cheese shops, and produce stands, so it certainly looked fairly legit. It was open on Sunday, a rarity in Paris, which potentially meant it was less likely to be good, but also meant it was on option on a day when our pickings were slim. The staff were nice, but everyone else in the store spoke pretty much exclusively French, even though I'm sure they get many English speaking visitors. Anyway, as impressive as it looked, it wasn't very good. Neither treat we had was remotely good enough to warrant a return visit, even though the place had so much potential ... at a glance. The awning out front was slightly worn, but the bright yellow color was inviting. An ice cream and sorbet stand is placed out front during the day. I never saw anyone going for that, which makes sense, as there are good places for sweet icey treats elsewhere on the street, and Stohrer isn't known for their ice cream. The front window had a display case with savory treats, that all actually look like they should be sweets, until you look closer. In this photo, the dome on the right is actually wrapped in smoked salmon. Next to that is cheesy scallops. On the far left is a foie gras brioche! The place clearly speaks my language. Turning savories into pastry-looking items? Um, yes? Strangely, none of these were refrigerated in any way. That scared me a bit. 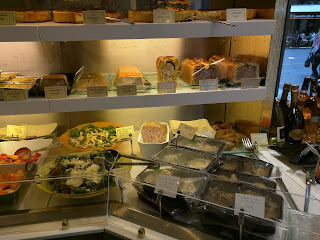 Quiches, Pate en Croute, Meals. Moving inside, the savories continue, with a slew of puff pastry wrapped pates, quiches with an amazing flaky looking crust, and prepared meals. These items really did all look good, and, since it is a pâtisserie, I imagined that the puff pastry and crusts used would be awesome. 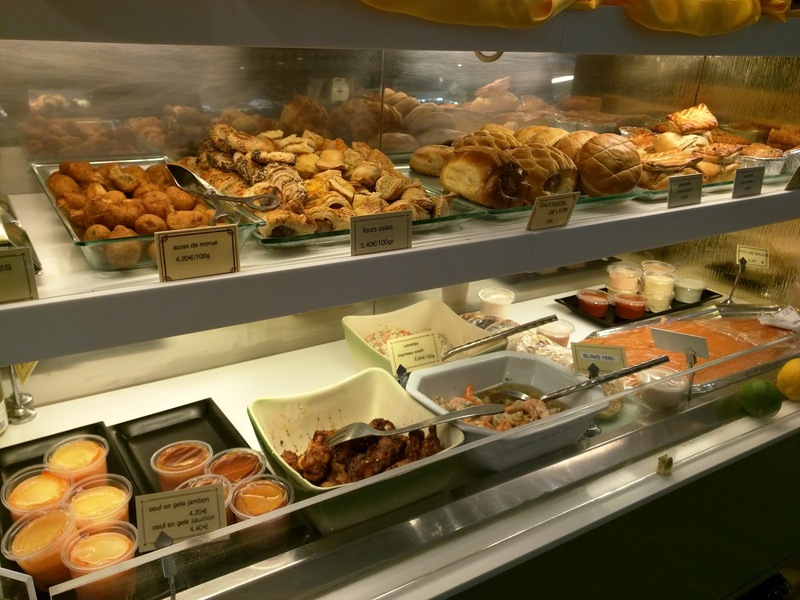 I added it to my list of places to return for an easy savory bite, but on this visit, we were going for sweets only. More and more savories continued, with assorted composed salads, and all sorts of little trays of cheesy gratins and main dishes. 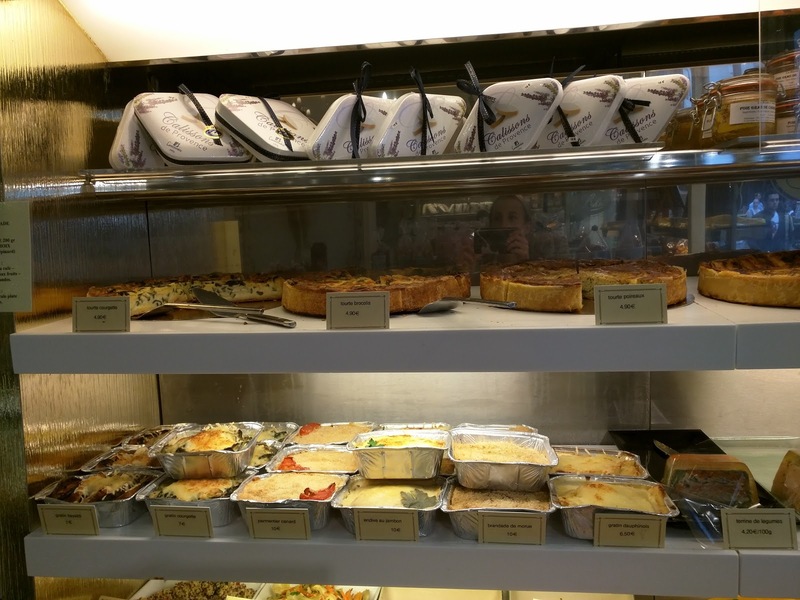 More and more quiches and gratins. This seems like a great place to pick up some savory items to heat up at home. Seeing all this really re-assured me a bit, because tourists wouldn't be getting these things, right? The savories weren't done though. 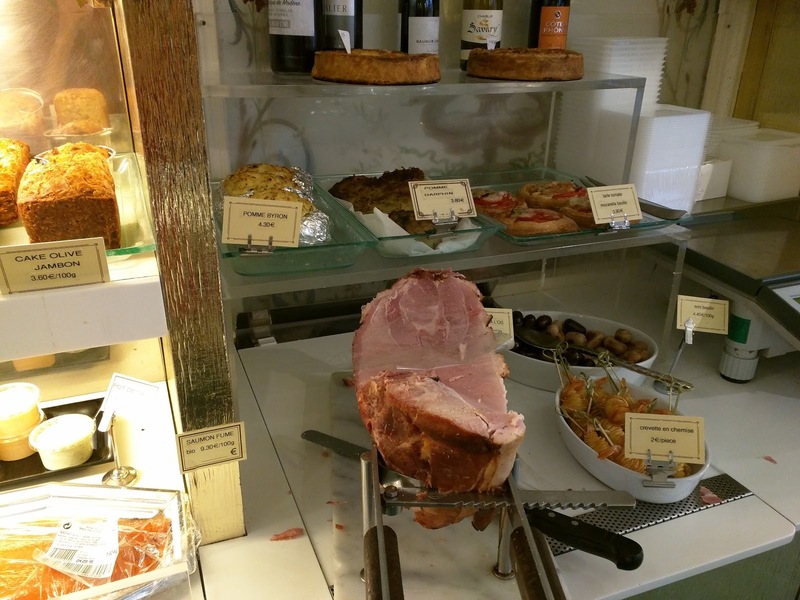 Next was ham sliced to order, mini tomato and cheese tarts, fried shrimps, and more. And more, smoked salmon, shrimp salad, chicken wings, all sorts of wrapped means, including mini versions. You could easily get a great selection for a picnic, or even cater a appetizer party here (in fact, they also run a catering business). I don't have photos, but in the afternoon, they also have a large assortment of sandwiches. 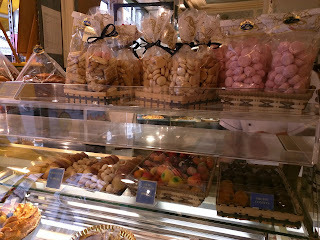 Moving on to sweets, there were too many to enumerate here. 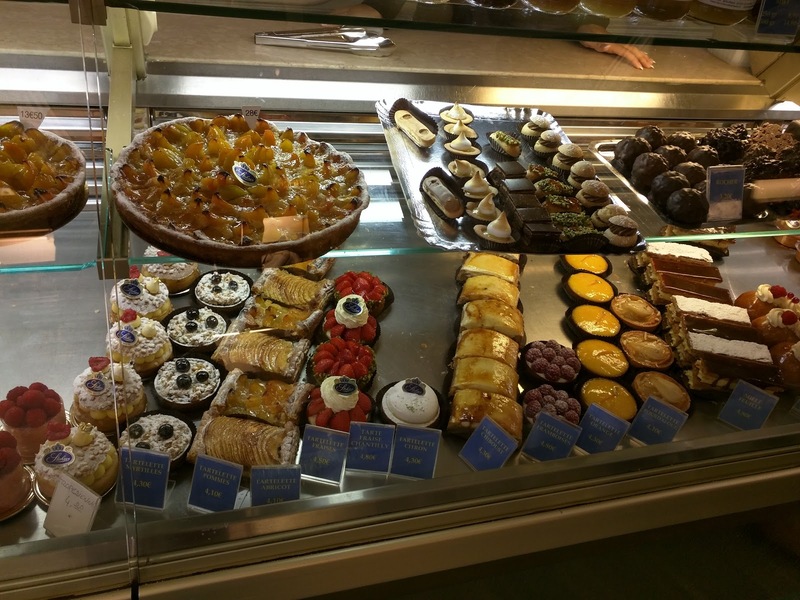 A large variety of desserts, including all the classics - mille-feuille (in 3 different flavors), paris brest, tarts, cakes, rhum baba, and even a cream filled rhum baba. And trays of minis, if you really just can't make up your mind. This photo only shows one of many sections filled with sweets. 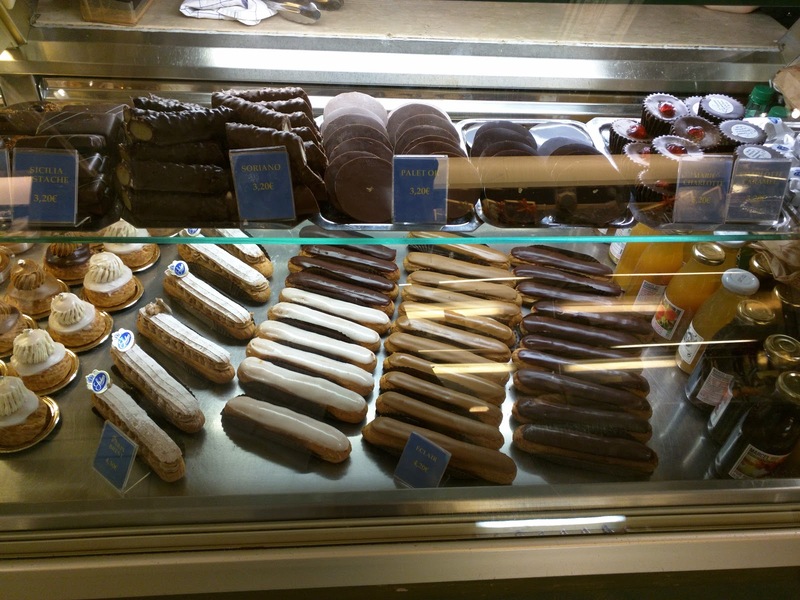 The eclair selection took up a fair amount of space as well, and there were several cases with chocolates as well. 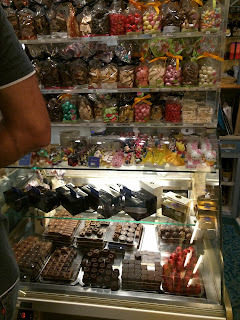 Oh, and did I mention, they kinda double as a candy store? Bags and bags of candies and more chocolates too. Even though it was late in the day, there was still a selection of viennoiseries, including croissants, chocolate croissants, almond croissants, raisin swirls, sugar brioche, praline rolls, canelles, and more. And brownies, a bit random. 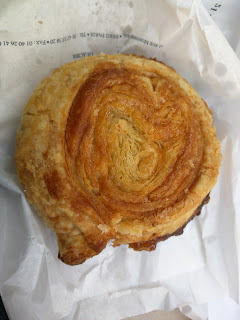 Even though I was there to scope it out the first time, I almost broke down an ordered a kouign amann. I love these things, but, I vowed to return and get one at a more appropriate time. I'm including a review of the wrapping, since I was really amused by how differently places package the treats in Paris. Here it was simple and old school. Generic thin plastic bag, paper wrappers around the treats, sealed with tape. 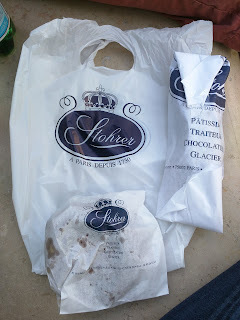 The bag and papers had the Stohrer logo on it, but this was hands down the most rustic packaging I saw. No bag with fancy handles, no cute boxes that don't stay together. It turns out, there is a reason places use cute boxes, since they help protect the goods. But more on that in a minute. The shop has no seating, so Ojan and I took our treats to a nearby bench to consume our treats. We didn't walk far, no more than 2 minutes, but, our pastries didn't remain in tact. -1 for packaging. And finally, what you are waiting for, the review of what we actually ate. We selected two items to share as an afternoon snack. One of Ojan's favorite treats is a chocolate eclair. I don't like eclairs much (since I don't like choux pastry), but Ojan loves them, so I did research eclairs in Paris. 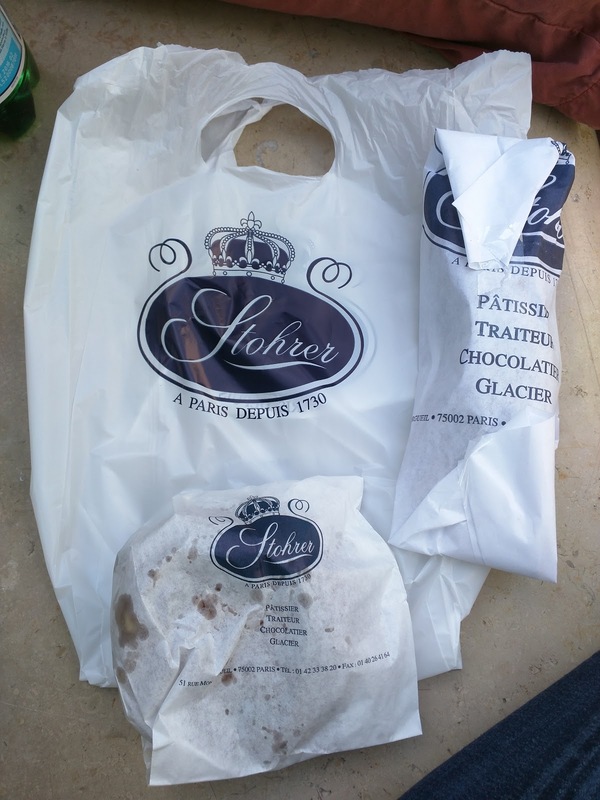 People like the eclairs from Stohrer, the chocolates ones in particular, so I agreed to get one, for his sake. I was also surprised by the price, 4.20€ is higher than many other places. The eclair was ... fine? As expected though, I didn't like the choux pastry, as it was really eggy tasting to me. It also just didn't seem like anything special. There was plentiful filling, a chocolate cream. The cream was actually pretty good, a thick, pudding-like, milk chocolate. It had a good chocolate flavor, and I think really would make for a nice bowl of pudding. The chocolate icing on top was a deeper chocolate, again, pretty good. 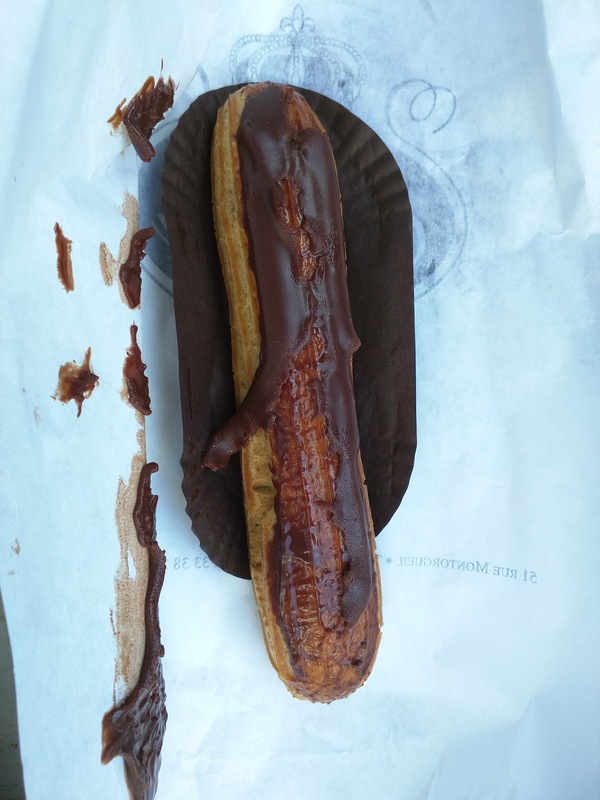 But still, this was an eclair. The filling and topping were good enough, but it really wasn't the treat for me. Sadly, Ojan didn't care for it either. He said "It is ok", ate half, and threw out the rest. I salvaged the filling and icing. We clearly wouldn't get another. 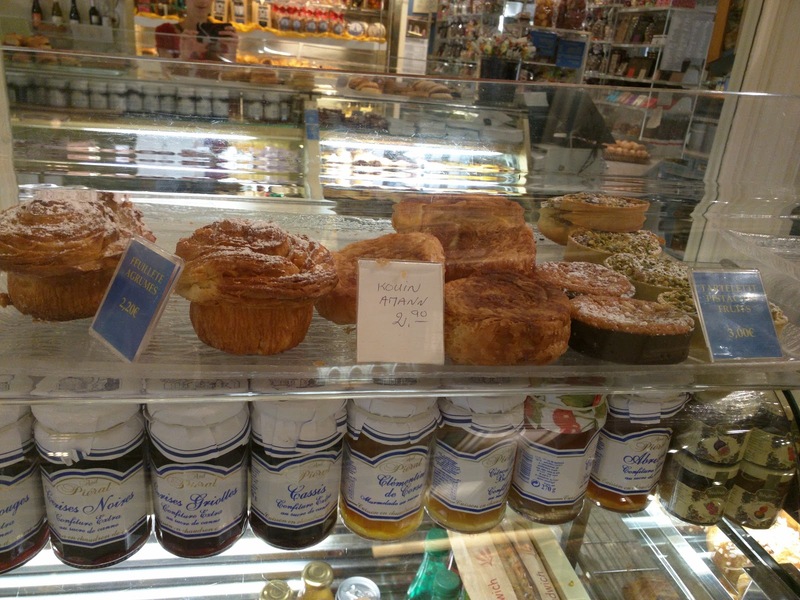 I couldn't resist the kouign amann. 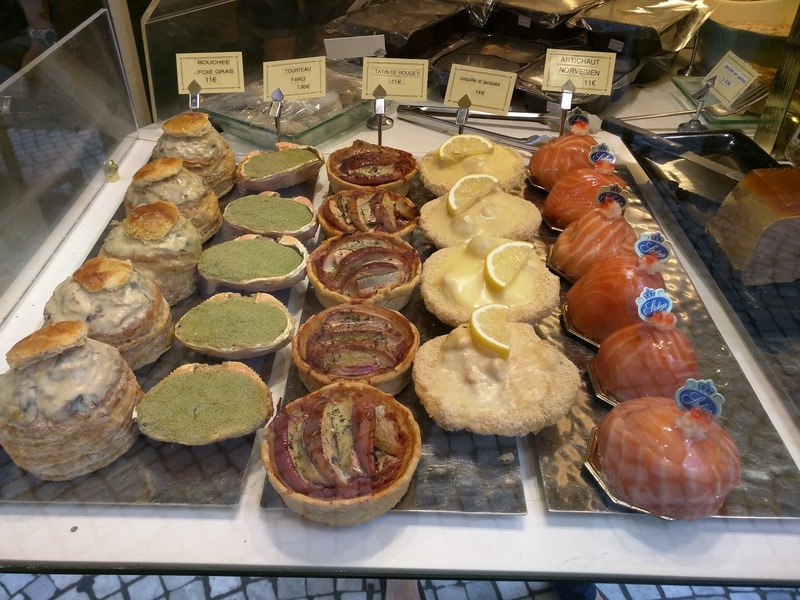 Particularly when the day before I saw the kouign amann at Blé Sucré and really wanted one then. Sure, it was mid-day, I didn't have a coffee to go alongside it, but, how do you not get a kouign amann, particularly when the staff member smiles and tells you how good it is? Plus, Ojan was yet to ever have one fresh, and I want him to understand the wonder that a kouign amann can be. The exterior was flaky. The inside was moist. But it really lacked the sweetness that a good kouign amann has. It was rich with butter, the other essential component, but that just made it feel heavy and greasy. The real problem was the lack of caramelization. It just wasn't very good. 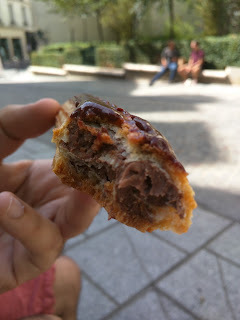 Ojan liked it more than the eclair though. We'd never get it again. Ha, ok, lols. On our second visit to Paris in 2016, nearly a year later, Ojan wound up at Stohrer, unaccompanied. And you know what he bought himself? Another kouign amann (and a chocolate covered caramel bar). He brought back part for me, and, I mocked him pretty badly. How did he not remember how unremarkable it was? I almost didn't bother trying it, but, I mean, really, how am I not going to eat a pastry sitting in front of me? It was ... better than I remembered. It was sweet, it was caramelized. It was buttery. So, actually, it was fine, but, still, not the levels of amazingness that a really fantastic koiugn amann can be. Les Cocottes. Located only a 5 minute walk from the Eifel Tower. Owned by a chef who owns a series of restaurants. Open 7 days a week, for both lunch and dinner. These should be the sort of details that lead me to never consider a restaurant. Tourist areas are never known for their food being actually tasty. Or reasonably priced. And in Paris, a place open on Sundays? Please. Yet, as I did my research on places to eat in Paris, I kept seeing chef Christian Constant's establishments mentioned. He owns 5 restaurants, all in the tourist areas, all different concepts. All shockingly affordable. All well regarded. Hmmm. I dug in more, and found out that he earned 2 Michelin stars at a previous high-end restaurant, and then branched out on his own, starting smaller, more casual, friendly restaurants focused on quality food in a nice atmosphere at a reasonable price. So, throwing caution to the wind, Ojan and I set out to have a relaxed simple dinner at one of his restaurants: Les Cocottes. 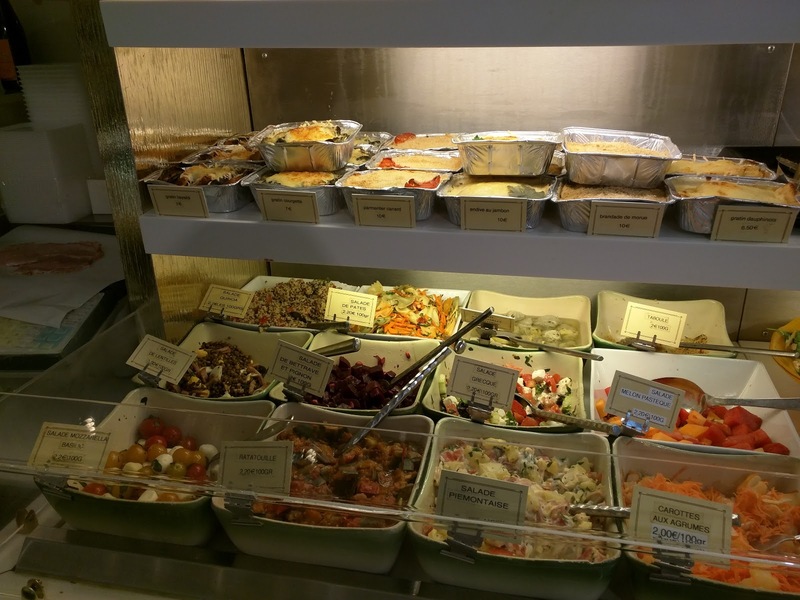 The restaurant has a fairly simple concept: everything is cooked, and served, in casseroles. So yes, now I'm adding on "concept restaurant" to the list of attributes that should scare me away. I'm glad we took the risk, as it turned out to be exactly what we were looking for. It was casual and comfortable, service was friendly and accepting of our non-French speaking, it was fast and efficient, and, tasty. Highly recommended. 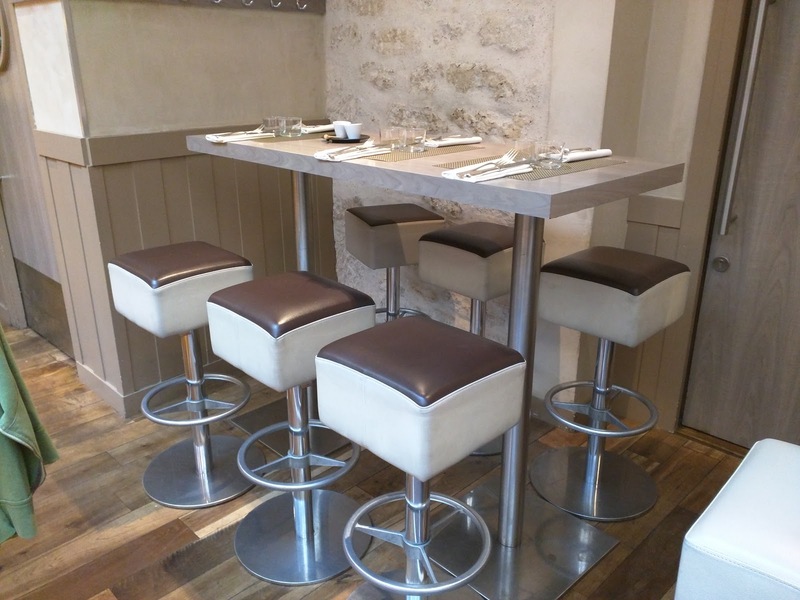 A long counter runs the length of the restaurant, with stools for seating along it. This is the area we were seated, served by a bartender behind the bar. At the far end of the restaurant was a chalkboard menu (although we were provided plastic laminated menus too, and in English! ), and an open pass to the kitchen. There weren't many seats besides the counter, but there were a few high tables with rather uncomfortable looking backless stools for groups. 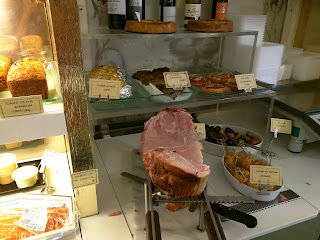 When we visited Les Cocottes, neither Ojan nor I were particularly hungry. We were still feeling hungry at odd times of day due to jetlag, and I for one was not holding back when it came to eating all the pastries and sweets in sight, so I was basically indulging all day long. I picked Les Cocottes partially because I knew it was casual, and hopefully they would be ok with us not each ordering a 3 course meal. The menu broken into many sections, each with only a few options. It was really easy to navigate. To start, there were two salads, two soups, a few verrines, and three appetizer "suggestions". 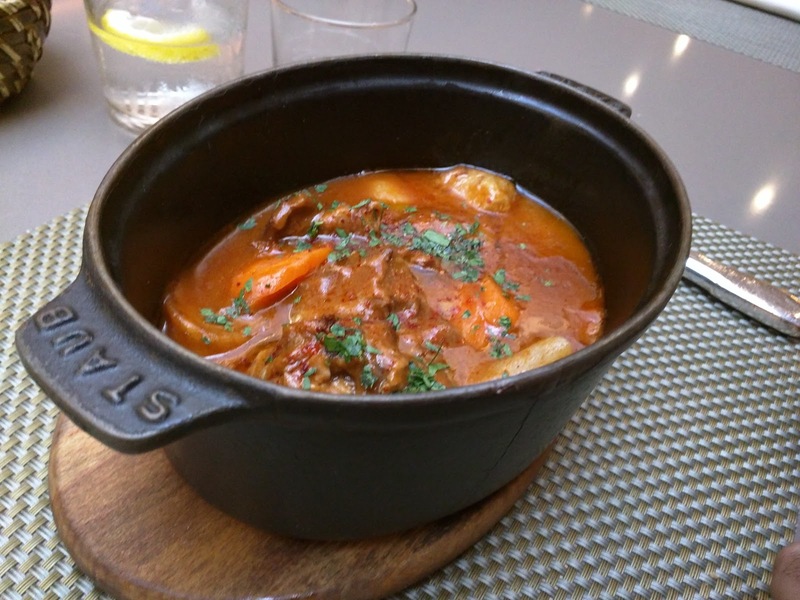 For mains, everything is the signature cocottes, dishes cooked in cast iron casserole (four on the regular menu, plus another four "suggestions"). In addition, there was a soup of the day and a cocotte of the day. The dessert section was the largest, with 10 options! People say that they wish they could visit the restaurant just for dessert, the desserts are that good. Desserts are everything you'd expect, including Christian Constant's famous chocolate tart, chocolate mouse, seasonal fruit crumble, creme brûlée, and many more. Oh, and fresh waffles served with a generous amount of chantilly cream, and chocolate and caramel for you to drizzle over. Ojan wanted only a main, and I had my eyes on two starters, so we opted for a soup, a starter, and a single main dish to share between us. The server didn't seem annoyed with us, with I appreciated. Of course, we planned on getting dessert, because the dessert menu was so epic. Sadly, by the time we reached the end of the meal, we just couldn't bring ourselves to eat more food. Silly jetlag, and over-indulging all day long, getting in the way for more great food! Vin de pays du Mont Caume Domaine Ray-Jan 2014. 5€. The wine list was the most reasonable I encountered in Paris. There were 4 whites and 4 reds available by the glass, all for 5€ or less. These were also available in several carafe sizes. Of course, a bottle menu was also available. 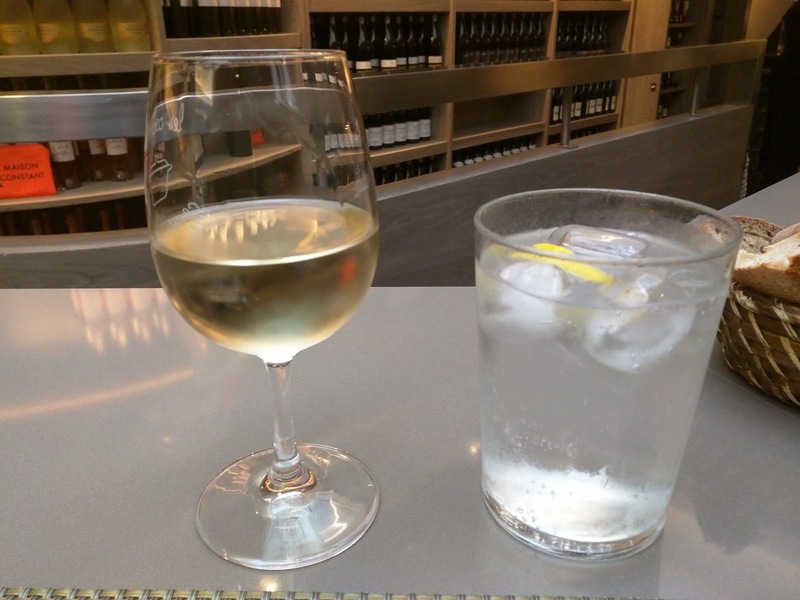 I asked for a recommendation based on my order, and the server first suggested a petit chablis, commenting that it was quite dry. I tend to like less dry white wines, so I asked for an alternate, and wound up with this. It was totally decent, not too dry but certainly not sweet, and it did go nicely with my meal. The 5€ price blew me away. Les Cocottes was also the first place I saw not trying to sell bottled still water. There were small cups at each place setting for tap water, which was given by default, using carafes that they kept stocked behind the bar. Still, I opted for sparkling, since it is what I prefer, but I really appreciated that they weren't pushing pricey water on everyone. Ojan went for a housemade french-style lemonade, quite sweet and tart, and he really enjoyed it. Basically as soon as we ordered, a cute bread basket was placed in front of us, literally the only item NOT served in a cast iron casserole. Inside were two slices of a darker, sourdough smelling, sliced bread that I avoided because I dislike sourdough, and 4 chunks of a pretty decent baguette. 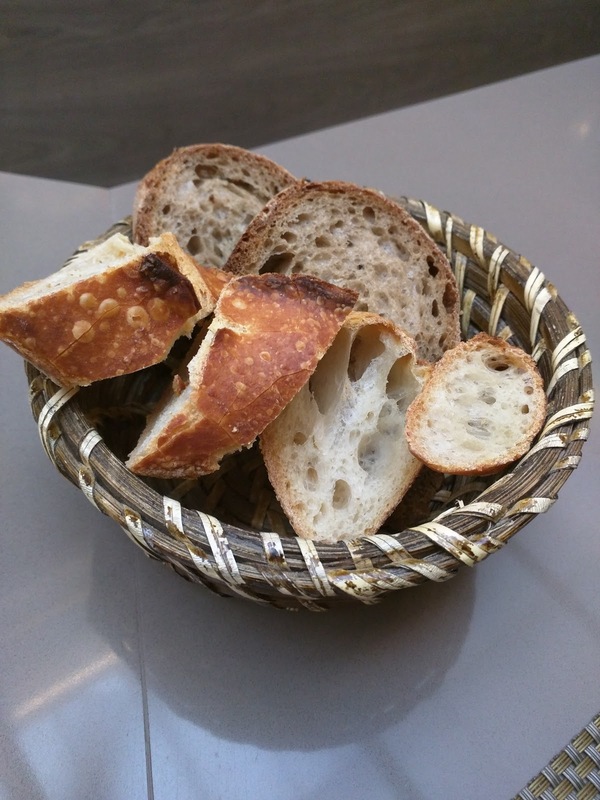 As seems customary in France, no oil nor butter was served with the bread, and it wasn't served warm. I'm usually so critical of places in the US for serving cold bread, or for not providing something to dip into, but, it makes sense here. The baguettes are just so good you don't need them hot. It was soft and fluffy on the inside, and crusty on the outside. A proper baguette. We mostly ignored the bread though, as we weren't very hungry, and saw no reason to fill up on bread. That is, until our dishes arrived, and had the most amazing sauces ever. We ended up devouring the entire bread basket, dunked into our dishes. But more on that soon. Bisque de crustacés à l’ancienne, chantilly combawa. 8€. To start we opted for the seafood bisque, from the "les potages" section of the menu, where we had the choice of a daily soup special that involved melon so I couldn't pick it, or tomato gazpacho, both chilled. 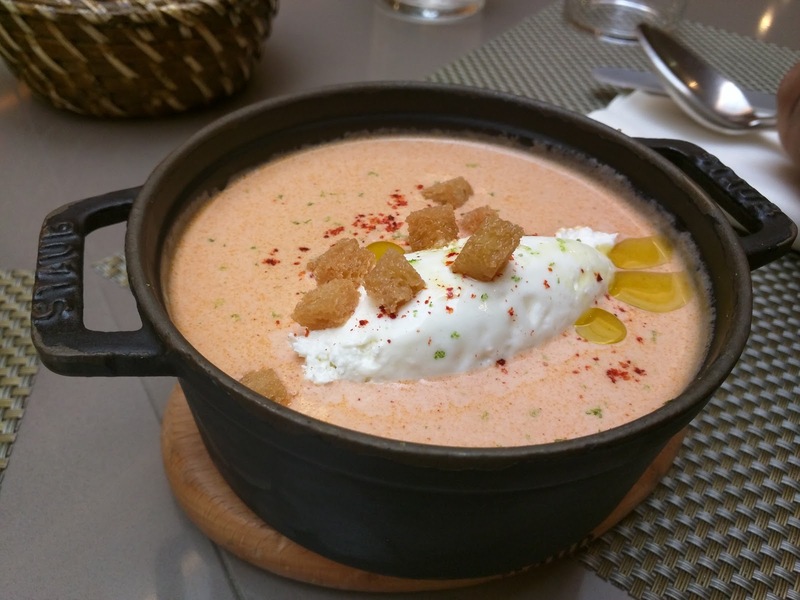 I'm not normally one to eat soup, let alone order soup at a restaurant, but nearly every review I read talked about this amazing seafood bisque, so, I had to go for it. Plus, I wanted a light meal, and so a soup to start seemed like a good idea (although I knew this wasn't going to be a light choice). When it arrived, I took my first eager spoonful, and was quite confused. It was ... cold? I tried again, thinking perhaps only the top was lukewarm? No, stone cold. Not at all what I was expecting. Cold seafood bisque? It was made even more strange given the fact that the server mentioned that the special soup was chilled, and the menu listed the gazpacho as chilled, but there was no indication anywhere that this one would be a cold dish. Like all dishes at Les Cocottes, it was served in a cast iron casserole, which was placed on top of a wooden board. Another reason I expected it to be a hot, comforting bisque. I thought it was odd that no reviews mentioned the temperature either. Anyway. The bisque itself was smooth and creamy. It had a subtle seafood flavor, not fishy, not overpowering, just quite lovely. In the center was a VERY generous dollop of chantilly cream. It was drizzled on top with a finishing oil and sprinkled with a red spice. There were also a few tiny croutons sprinkled on top. The croutons were crazy oily and fried, super crispy, which added a texture I liked, but I thought they were too oily. Ojan however really liked them. Overall, it was a nice bisque, but it was incedibly rich (before you even got to mixing in the cream). I liked the cream too, but it was hard to each much of it. Ojan described it well, when he took a few spoonfuls and said, "this is more amuse-bouche level of rich than full bowl". He was right; a few spoonfuls was really delicious, but even if I was really hungry, I can't imagine eating a full bowl. And, the portion really was quite large. While neither of us could really handle this by the spoonful, we quickly discovered that it was fairly amazing when you dunked the crusty baguette in it. I wanted to save room for my next dish, but I couldn't resist dunking more and more bread into the bisque. I wasn't planning to fill up on bread! So yes, a mild, nice enough bisque, and a huge portion for the 8€ price, but I wouldn't get it again. I also still just don't understand why it was cold. Ravioles de langoustines, mousseline d’artichauts. 16€. For my main, I opted for a starter, again, another dish that I read rave reviews of: langostine ravioli with artichoke mousseline. And again, a bit of a strange choice for me ... I don't really like artichokes, and when do I ever love shrimp? But, it sounded like a light option (particularly as it was actually a starter), and well, people loved it. And again, the server had no problem with me ordering this as a main, and brought it alongside Ojan's main dish. 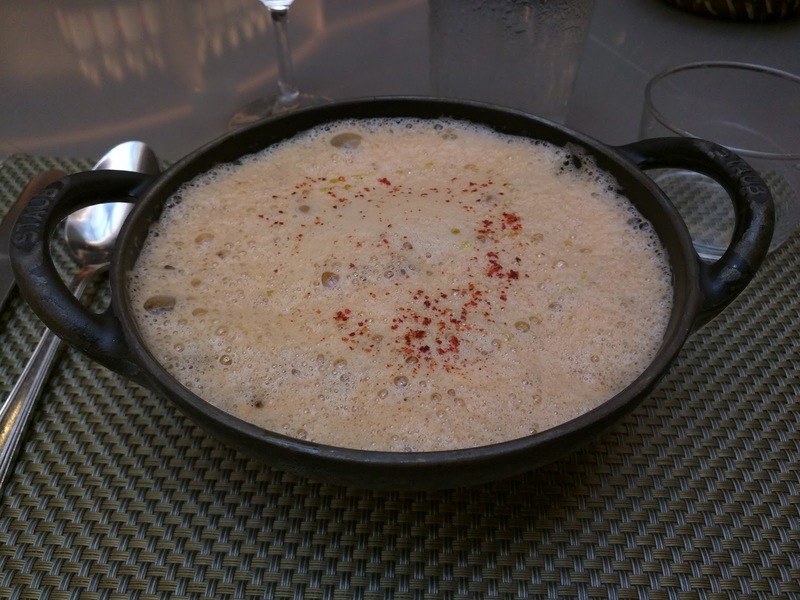 The ravioli, and the artichoke mousse, were both hidden under a thick, frothy foam. Like the previous dish, it was finished with oil and a red spice. The artichoke mousse was in the bottom of the dish. It was creamy, but, well, I don't really like artichoke. Whoops. Luckily, it was easy to avoid this. On top of the mousse were the raviolis, which were more like Asian-style dumplings than what I think of as ravioli. The skins were thinner than Italian pasta dough and translucent. Inside were large pieces of prawn, and you could see them through the wrappers. The preparation of the ravioli was spot on, the wrapper soft, the prawn tender. A very delicate dumpling basically. The foam on top was amazing. I don't know what it was exactly, but it was really flavorful. The dumplings, with this foam-sauce, made for the perfect light dish I was looking for. I also couldn't resist using more bread to get every last drop of that foam. This is why the French don't serve butter or oil with their bread, right? They have such amazing sauces with the dishes that you need some way to soak up! Overall, I really liked this dish, and would totally order it again, and just ask for the artichoke to be left out. The 16€ price was reasonable too, particularly given that I considered it a main dish. Sauté d’agneau aux épices douces, carottes et navets. 22€. Ojan wanted to order something from the "Les Cocottes" section of the menu, given that these are their specialty. 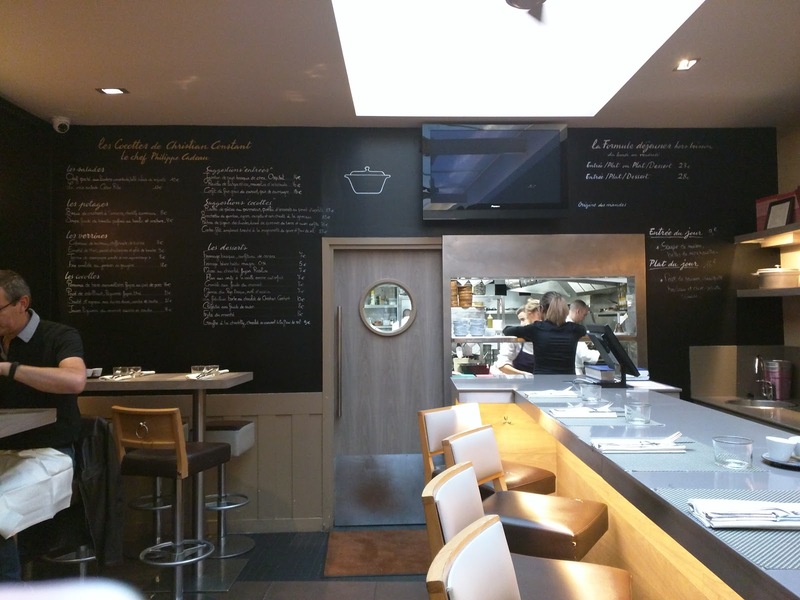 He had the choice of a risotto, cod, lamb, or vegetable cocotte from the regular menu, or the daily special of salmon. Normally, I'd urge him to get the cod, but I really didn't want more food, and I had cod the previous couple days so I was a bit sick of it. He was eyeing the lamb, and I don't like lamb, so I gladly encouraged him to go for it. His was served in a cast iron casserole, and it was piping hot. Inside were chunks of lamb, with potatoes, carrots, and turnips. Very rustic style. I didn't try it, but Ojan said he was impressed with how well cooked the lamb was. It was tender, soft, well cooked down, and even the parts that were fatty were nicely braised. The vegetables were a bit inconsistently cooked, but he actually liked that for texture. The sauce was a bit too spicy for him, but not too bad. Like all the dishes, it too was finished with oil. In all cases, it wasn't an unappealing oil slick or anything, just a little drizzle which helped really enhance the flavors of the dishes. Ojan liked this, and was quite satisfied by it. The portion was large for 22€. 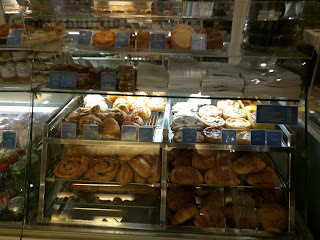 Paul is a chain of bakery-cafes in France. I saw them on what seemed like every other street corner in Paris, nearly as prevalent as Starbucks in the US. Given the large selection of tiny, local bakeries, I had no intention of actually going to a chain like Paul, but on our last night in Paris, we stayed at the Sheraton at the airport since we had an early morning flight, and our dining options were a bit limited. If this story sounds familiar, that is because I also went to McDonald's there, and actually enjoyed my Croque McDo! The afternoon before our grand McDonald's adventure though, Ojan wanted a easy lunch to take up to the hotel room, so he went down to the terminal, and came back with a sandwich and a salad from Paul. Only after he came back, did I do a little research. Paul was started in 1889! Now that is an impressive chain history. They have locations in many other places now, including all over Europe, China, Japan, and a few in the US. They have >400 worldwide now. Paul serves cafe basics like sandwiches, soups, and salads, plus French classics like quiche and crepes, and an assortment of viennoiserie, cakes, tarts, and macarons. Oh, and a lot of bread. I was a bit disappointed that Ojan didn't come back with baked goods, but he tends to be the responsible one when visiting a bakery. It was better than I expected. Certainly not mind blowing, but better than what I'd imagine to be similar establishments in the US, and the bread quality was high. 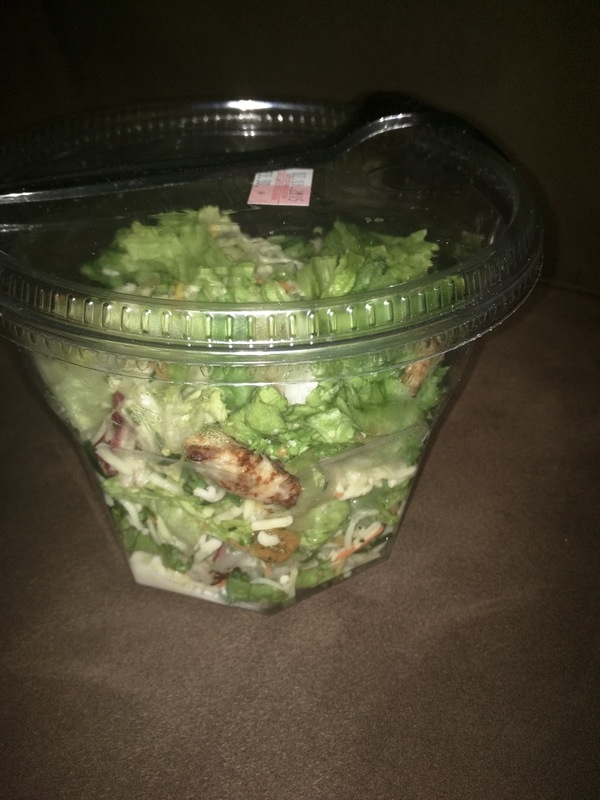 "Chicken, parmesan cheese, Caesar dressing, garlic croûtons, salad, chives." The salad he picked was the signature salad, the "Salade PAUL", which you and I know as a chicken caesar. The dressing was all in the bottom of the container, which I think is actually nice, since it didn't make the entire thing soggy. Keeping it separate however would be an improvement. The lettuce wasn't really very fresh, lots of brown edges. It had assorted types of lettuce, not just romaine, perhaps what makes this something other than a caesar? There were two types of cheese, one was the promised parmesan, large shreds. It was good enough. The other though, seemed to be tons of shredded generic American ... or white cheddar ... or mozzarella seeming cheese. It had no real flavor. I didn't try the grilled chicken since I don't like chicken. So far, nothing interesting here. Except, the croutons. They were small little croutons. Well seasoned. Super garlicky. Super oily. Incredibly flavorful. Delicious. Ojan never ended up eating this salad, as he got way too much food, so I devoured all the croutons with the shredded parmesan. Oily, garlicky, delicious. The salad was also insanely large. I can't say this is worth getting, but I really enjoyed the croutons. 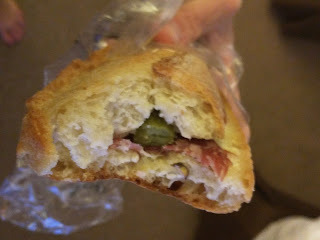 It was served with a chunk of baguette, also pretty good, but more on that in my sandwich review, as it was the same bread. "Pain paulette nature (150g), rosette, beurre, cornichons." Ojan also got a large sandwich. He opted for the Sandwich Savoureux. It was a simple sandwich, a classic baguette, filled with huge pats of butter, salami, and cornichons. Oh so French. And also, really quite delicious. The bread was soft inside, crusty outside, and actually better than a lot of the bread we encountered in Paris (not that we were really seeking out basic baguettes for the most part, besides the baguettes from Boulangerie Paul (not Paul, Boulangerie Paul. You'll see that review soon). The butter was standard for France, far better than what we get in the US. The salami was tasty enough. I loved the cornichons, they were salty, and added a great crunch. It was simple, it was a sandwich, but, I enjoyed it.